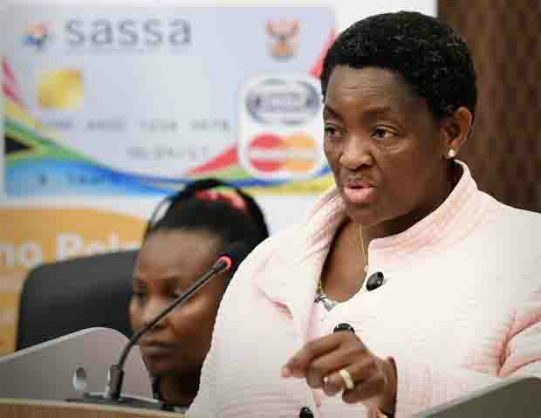 Social Development Minister Bathabile Dlamini says Sassa will eventually take over the grants payment system. Minister of Social Development Bathabile Dlamini briefed the media in Tshwane on the progress her department has made regarding the “institutionalisation of the social grants payment system within the SA Social Security Agency (Sassa) beyond the 31st March 2017 when the current contract with Cash Paymaster Services (CPS) expires”. She made it clear that grant beneficiaries would receive their payments on April 1. She slammed people who had gone out to “complain about the crisis”. Dlamini confirmed that they had invited Treasury to the negotiations “because they are very important”, but Treasury had declined to participate. The department confirmed that there was not yet any final deal with CPS in that no signed-off contract had yet been signed. As a result, no information was released on the amount CPS might charge to continue to provide a service. This appears to contradict an earlier announcement on Friday that there had been a deal after three days of negotiations. The department responded that it was simply a case, however, that a deal had not yet been signed off. At her briefing, she recapped the background of the Sassa-CPS saga, when it was ruled by the Constitutional Court in 2014 that the CPS tender had been constitutionally invalid, but that the contract was allowed to run its course until April 1 2017 so that a new service provider could be found. “At the time, five companies bid for the tender, two withdrew.” She said the remaining three lacked capacity. Dlamini defended the action she and her staff had taken, claiming that no other service provider could be found to do the job in a manner that was to her department’s satisfaction. Sassa could also not take over the function because “it has always been outsourced”. She had earlier said that “fraud and corruption is well documented in cash transfer systems throughout the world and South Africa is no different”. She also admitted that “our system has seen the worst form of abuse and theft”. She admitted that she had been given legal advice by SC Advocate Wim Trengove advising her that since there was not enough time left to put the tender out again before the deadline, the department should ask the court to allow for a deviation from normal tender processes to allow CPS to continue. Dlamini explained that there were six options on the table to ensure grant options continued to be paid, and that the long-term plan was to work closely with the SA Post Office to capacitate this state-owned entity to take over the grants payment system. She said they were committed to using more than 2 600 post office outlets as part of the grants payment system. “Our ultimate goal is that Sassa should provide an integrated grant administration and payment process. This entails Sassa acquiring own payment card which can operate in an open and closed system, underpinned by the use of a biometric authentication system. “The new payment plan is implemented over four phases. The two first phases have already started, that of dealing with the challenges facing our communities and that of the task of the advisory team … and then the planning of the transition … including phasing out of the current service provider between the years 2015, 2016 to 2017. “The next phase is the transition of April 2017 to March 2019. Phase 3: Full roll-out from April 2019. The department made it clear they would not comment on the resignation of director-general Zane Dangor, who said he had experienced a breakdown in the relationship with the minister.